We are so excited to be starting our way south. How fortunate we’ve been that this has been a very mild fall and living on a boat h as been very comfortable with these temperatures. Our departure was pushed back by just a day so that Jim could see his dermatologist and have a simple procedure done. On the positive side that gave me more time to run to the grocery store, again! It was a last minute treat to have dinner with my brother and sister-in-law at the Bayard House while taking in a view of the C & D canal. 9:45 on Saturday, October 28th we brought in the lines and worked our way out of the marina as Ted & Pam waved us off. This was it, we are really doing this! The first thing we noticed was that the water was choppier than we expected it would be. Jim said “I sure hope this settles down.” Unfortunately, that didn’t happen. 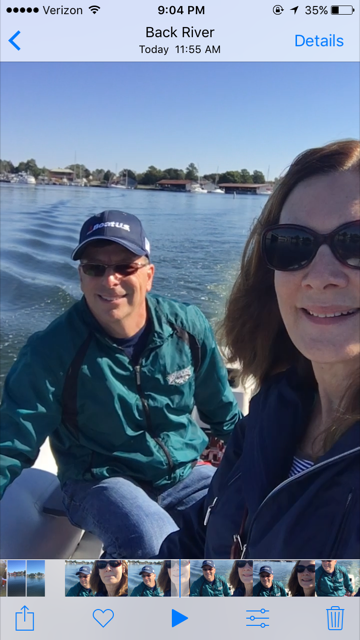 We experienced a 4 and a half hour bumpy, rough ride down the Chesapeake Bay to Solomon’s Island. It was great to feel the confidence that both Jim & I have gained over the past 6 months since we went to New England. Jim now trimmed the tabs to bring the bow down, lessening boat’s pounding on the water. He could also play around with taking the waves at an angle. Of course this would throw us off course, so then he would re-set and go the other way. Sometimes I just needed a break from the pounding and I’d request that the captain slow the boat down! But after a little slow time, he just wanted to speed it up so we could get to our destination. It was such a relief as we pulled into the calm waters of the Patuxent River. 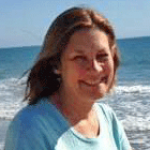 It wasn’t long before we found Calvert Marina. As Jim began to tie the boat up to the slip, I got Blue off the boat and took him for a walk so that he could relieve himself! Next the cabin needed cleaning up. The printer, once again, took a nose dive, the refrigerator door came open and some of the contents had spilled on the floor and lastly another wine glass smashed in a million pieces all over the galley! Sunday we hunkered down as a storm hit the area. Jim happily watched his beloved Eagles team win again and I prepared a warm spaghetti dinner. As the day went on the winds picked up significantly and before turning in for the night Jim decided to be sure the boat was well fastened. In the dark, wind and rain he took good care of his girl! We climbed into bed and felt the boat be pushed against the dock and then pulled away toward the water. We listened to the wind and the fenders creak. By morning the rain subsided but the winds continued. I bundled up and took Blue for a nice long walk around the marina and down the road. 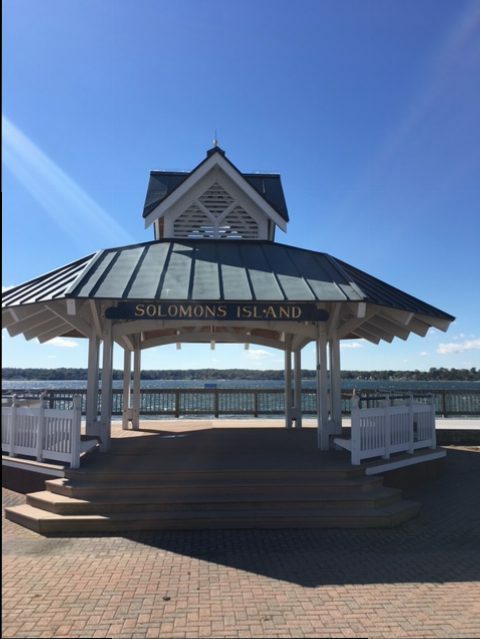 We decided to venture into town and check out Solomon’s Island. Burt’s Taxi was our ride to town. That was an experience in how not to run a company! We had a delicious lunch at the Lighthouse restaurant overlooking the harbor. Then took a walk through town, stopped in one gift shop and went to West Marine. Uber was our ride back to Floating Home. Today is a work day for Jim, with a number of coaching calls and other work to do. We did take the dinghy across the harbor for fun, pinching ourselves in disbelief of this amazing experience we are enjoying. The sun is shining and I have taken Blue for a few long walks to be sure he’s getting plenty of exercise. I also rolled my yoga mat out on the aft deck and worked out for a bit. 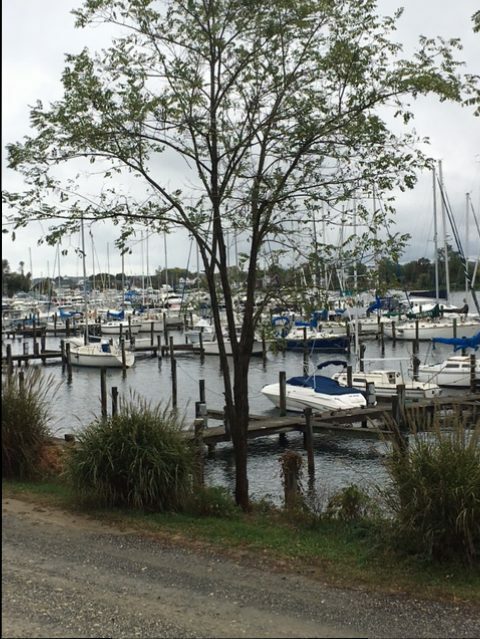 Now that the weather has calmed, a parade of boats left the harbor.